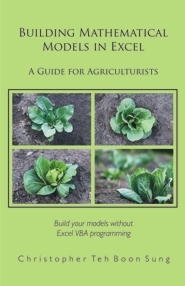 This book is for agriculturists, many of whom are either novices or non-computer programmers, about how they can build their mathematical models in Microsoft Excel. Of all modeling platforms, spreadsheets like Excel require the least proficiency in computer programming. This book introduces an Excel add-in called BuildIt (available for free as download) that shields users from having to use Excel’s VBA (Visual Basic for Applications) programming language and yet allows agriculturists to build simple to large complex models without having to learn complicated computer programming techniques or to use sophisticated Excel techniques. This book first discusses how BuildIt works and how it is used to build models. Examples range from the simple to progressively more complex mathematical models. Ultimately, readers are taught how to build a generic crop growth model from its five core components: meteorology, canopy photosynthesis, energy balance, soil water, and crop growth development. Ultimately, agriculturists will be able to build their own mathematical models in Excel and concentrate more on the science and mathematics of their modeling work rather than being distracted by the intricacies of computer programming. Christopher Teh Boon Sung is a lecturer at the Faculty of Agriculture, Uni. Putra Malaysia. He has published two books and has over 40 journal papers and 90 proceeding papers. In 2011, he won the Bronze Medal Award for teaching excellence from his university.